If one of your friends suddenly turns mummy blogger then you know you’re going to be fodder the moment you do anything interesting with them. Today it was my introduction to cake decorating and as if that isn’t something I should be sharing then I don’t know what is. I generally focus more on how my baked goods taste than what they look like. I slap icing on birthday cakes mainly because I’m the one that gets to lick the bowl, but that’s as far as it goes. You could call my style rustic, if you were being polite. It turns out that there’s a whole world of pretty out there that can go on top of your homemade deliciousness and also that a whole lot of people rather like it. So when my good friend and neighbour who also happens to be such a good cook that she can make sparkly macarons without breaking a sweat offers to demonstrate basic cake decorating to a group of mortals, I’m so in. We gathered at another neighbour’s recently renovated house which is so perfect and clean and gleaming it just makes me cry a little inside. I’m good at the feeding the family side of housewifery and slowly improving on the end of year play costume making front, but tidying and cleaning aren’t my strong points. It was a shame to clutter up her shining benchtop with balls of fondant and rolling pins and sparkle powder and gel colours, but you’ve gotta do what you’ve gotta do. Hours of mucking around with playdough with your preschool kids will stand you in good stead for cake decorating. You can get the fondant from the supermarket – I had a look at the do it yourself version and it is possible, but only if you are able to work quickly which means lots of experience. You should use gel colours to colour it, but I did find that they leave a slight chemical taste. I wonder if I’m the first person to want to use natural colours? One of the girls suggests that this may not be the case, but the natural ones make you feel good and don’t really work. Isn’t this often the way? Perhaps I should go for all white decorations. 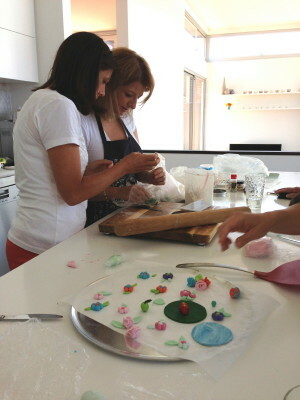 At its most basic, you just roll out the fondant really really thin. You can either cut out a circle to cover a cupcake (that has previously had a glue of ganache or hot jam applied), and or cut shapes and letters out. I was very tempted to photograph all of the pages in the Planet Cake book the guru brought along for ideas for pirate faces, cheeky monkeys, Mr Men and the like. You can also make 3D shapes, this stuff really does have a similar consistency to playdough. Pity birthday season is over in this house, but it does give me plenty of time to practise for next year. First, though, a visit to the cake decorating section of the local kitchen shop for sparkle powder. Remind me not to blog after the family has got home, if it has been a little disjointed it’s because I haven’t been able to get half a sentence out without being required to go and look at something, remove a knot from hair, deny a request and tell children every five minutes that I still haven’t decided what’s for dinner. If they ask me again, they’re getting quinoa. But they can have a fondant flower for dessert.